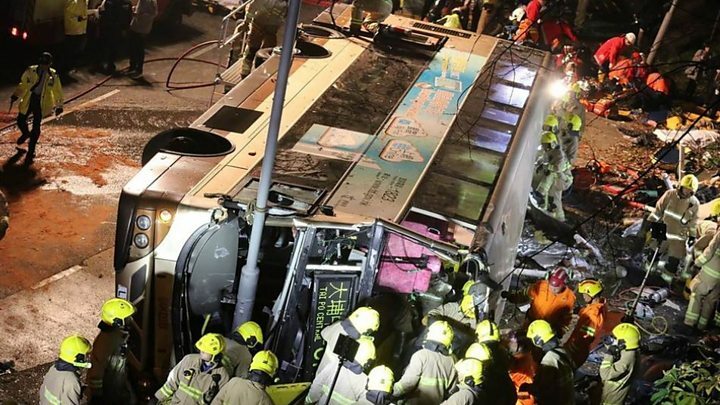 A double-decker bus has crashed in Hong Kong killing 18 people and injuring nearly 50, officials say. Police spokesman Lee Chi Wai said: "The driver is now in custody and the New Territories North police department will deal with this case." Hong Kong's public transport is usually safe, and fatal accidents on this scale are relatively infrequent. Hong Kong's chief executive, Carrie Lam, said she was "deeply saddened" after visiting one of the 12 hospitals that were treating the injured. Saturday's accident appears to be the worst since July 2003, when a double-decker fell off an elevated road after being hit by a lorry, killing 21 people. The lorry driver was jailed for seven months.